West End:- Great White Egret, 2 Little Egret, 1 Green Sandpiper, 1 Common Sandpiper, 8 Lapwing, 39 Mallard, 12 Mandarin, 2 Moorhen, 94 Great Crested Grebes, 26 Black-headed Gulls, 1 Kingfisher, 10 House Martin, 6 Swallows, 1 Buzzard. Great Egret, 2 Teal, 2 Kingfisher, 79 Great Crested Grebe, 11 Mandarin, Green Sandpiper, 5 Lapwing, 27 Mallard, Common Sandpiper, 27 Cormorant, 8 Grey Heron. Great White Egret still present. 104 Great Crested Grebes, 19 Black-headed Gull, 3 Swallows, 9 Grey Heron, 10 Cormorant, 4 Lapwing, Common Tern, 6 Mallard, Moorhen and 2 Mandarin ducks = mid morning. 13 Mandarins, 7 Common Terns, 4 Lapwings, 84 Great Crested Grebes, 1 Common Sandpiper, 3 Green Sandpipers, 1 Great Egret. 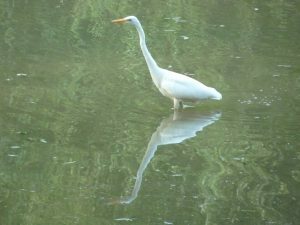 West End:- Great White Egret still present (about mid day). Great White Egret, 97 Great Crested Grebes, 7 Mandarin + 1 chick, 1 Green Sandpiper, 2 Common Sandpipers, 4 Lapwings, 5 Swallows, 2 House Martins and only 1 Common Tern. West End:- 1 Great White Egret, 1 Red Kite, 1 Common Sandpiper, 8 Mandarin. Dam End:- 160 Black-headed Gulls, 1 Lesser Black-backed Gull, 2 Common Sandpipers, 1 Mute Swan, 17 Common Terns, 4 Lapwing, 1 Swift, 6 Swallows. Whillet’s:- 1 Reed Bunting, 1 Blackcap, 1 Whitethroat, 3 Bullfinch, 1 Kingfisher, 2 Buzzards, 1 Kestrel. 16 Species of butterfly recorded in the Meadows including:- 1 Small Copper, 10 Common Blue, 4 Purple Hairstreaks, 2 Brimstone. Also 2 Ruddy Darters and 3 Brown hawkers.